KINSHOFER’s MQP Multi-Quick Processor is ideal for cutting and grinding concrete structures and the flow of reinforcement, metal structures and scrap metal, depending on the type of jaw mounted. Built-in DemaLink allows on-site jaw replacement in less than 10 minutes. 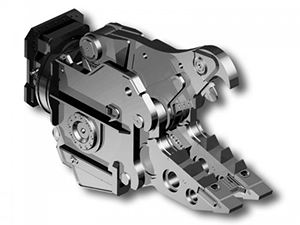 Six types of jaws are available: combined jaw (C), demolition (D), spray (P), steel (S), tanks (T) and universal (U). The patented DemaPower cylinder design provides 20% more power and faster cycle times up to 5 seconds!